The sun sets over the gateway of peyotera Amada Cardenas's house in Mirando City, Texas. Ironwork reflects core Native American Church values of faith, hope, love and charity. Back in the day, when the “grandmas and grandpas” of the Native American Church (NAC) needed peyote, they would make a 2,000-kilometer pilgrimage from the reservations of South Dakota to the tiny town of Mirando City, Texas, close to the U.S. border with Mexico. That’s where they could find Amada Cardenas, a Mexican-American woman who at the time was the only peyote dealer in Texas. Cardenas was not Native American, nor was she a member of the NAC. But she understood how sacred the medicine was to church members and defended its use as a religious sacrament to those who sought to ban it. 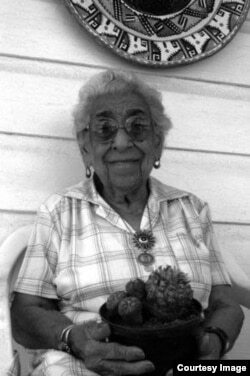 Amada Cardenas, holding a basket of peyote, outside of her home in Mirando City, Texas, 1994. 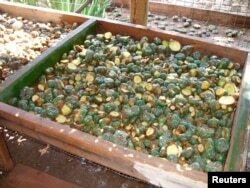 In 2013, NACNA began researching ways to conserve peyote and its natural habitat. 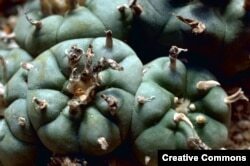 Lophophora williamsii, more commonly known as peyote, which grows in the wild in southern Texas and Mexico. Peyote, or Lophophora williamsii, is a succulent that contains psychoactive alkaloids and only grows in southern Texas and a handful of states in northern Mexico. Indigenous people have used it ceremonially and medicinally for centuries, as noted by 16th century Spanish missionaries, who condemned it as an evil. Peyote use persisted, however, and by the late 1800s, had spread to present-day Oklahoma, where tribes adapted it to suit their individual spiritual traditions. In the face of government efforts to ban peyote, peyotists in the early 20th century sought to incorporate as a formal religion. In 1918, an intertribal group established the NAC, which has evolved to include tens of thousands of members across dozens of tribal nations. Members view the church as an important component of healing from historic trauma and reconnecting to tradition. 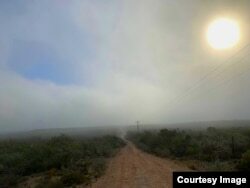 Texas allows several peyoteros registered with the U.S. Drug Enforcement Agency to harvest and sell peyote, but only to card-carrying NAC members with proven Native American ancestry. Peyote buttons are shown in the yard of a peyote dealer in Rio Grande, Texas, Oct. 12, 2007. Unlike other religious denominations, said Iron Rope, the NAC is not a unified theology. 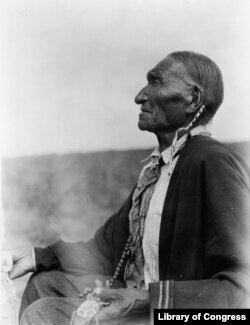 Wynema Morris, a member of the Omaha Tribe of Nebraska and an NAC member, grew up with an understanding of the sacredness of peyote and the religious etiquette surrounding its use. “It was my own grandfather, Samuel Thomas Gilpin, who actually received peyote early on from the Winnebagos, a neighboring tribe, and passed it on to his sons, my uncles,” she said. This 1924 photo by Edward S. Curtis is entitled "Cheyenne Peyote Leader." Courtesy: Library of Congress. Peyote is much misunderstood and maligned, she said, viewed by many anthropologists through the lens of colonial prejudice. She described all-night services of prayer, song and meditation. In 2013, NACNA began looking at ways to conserve and sustain peyote for future generations of indigenous Americans, Mexicans and Canadians. “It was our intent to eventually have our own land and be able to have our own peyote dealer who could understand our concerns as the Native American Church,” said Iron Rope. The sun sets over "the 605," acreage in Thompsonville, Texas, which the Indigenous Peyote Conservation purchased in 2018 for the conservation of peyote, a sacrament of the Native American Church. It is their hope that by 2021, “the 605” will house a nursery, residential and guest housing, and youth training, all supported by peyote sales.